All Christians agree that the Bible is an important book for understanding the story of God and God's people, but there is a wide variety of opinions and interpretations within the Christian community. In order for us to figure out what we believe ABOUT the Bible, we have to know what's IN the Bible and where it came from. Many modern Christians have only the most rudimentary understanding of this book about our faith, but here is an exciting new way to help your entire congregation learn about the Bible. 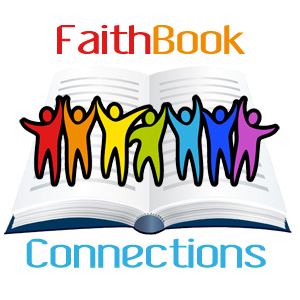 FaithBook Connections is a bundle of resources that has something for everyone, from traditional Sunday School classes to formation that is incorporated into worship to intergenerational fun activities for coffee hour. Christian formation doesn't just happen in a classroom -- it's part of our life as a Christian community. FaithBook Connections will help your congregation make the Bible, the book of our faith story, familiar friend. Don't just decry the "Biblical illiteracy" of today's church-goers -- "befriend" them with FaithBook Connections! Bible Basics: eight volumes of lesson plans with multiple sessions on each book of the Bible; you can use them for Sunday School classes or as event activities. All About the Bible: seven workshops on the Bible that use art, music, drama, story, kitchen, computer and movies to help younger children explore the Bible. Ten Commandments: six sessions on the ten commandments designed for fourth to sixth graders that includes the old Jewish story "A Letter to God," personal scrapbooks, explores the concept of covenant, and provides an opportunity for children to memorize the ten commandments. Miqra: Falling in Love with Scripture: weekend Bible marathon for youth who read the Bible continuously over 72 hours and explore the Bible in fun and fascinating workshops and activities. Who Says So? : Encountering the Authority of Scripture: a five-session adult education series that introduces people to the different approaches to reading and understanding the Scriptures and gives them a way to hear each other's perspectives graciously. Walking the Bible: fourteen session study guide that leads adults or older youth through the first five books of the Bible, using "Walking The Bible: A Journey by Land Through the Five Books of Moses" by Bruce Feiler (VHS & Book obtained separately). Bible-in-a-Year: several ways to engage your entire congregation in reading the Bible over a year's time. Bible Buddies: a way for parents (and other adults) to join their children in exploring Bible Basics at home, in neighborhood groups or small groups of adults at church or during the week. Uses the Bible Basics introductory materials and The Pocket Bible Guide. FaithBook Friend: an intergenerational activity for coffee hour time that invites everyone into claiming their favorite character for each book of the Bible. Fascinating Facts: simple, practical way to integrate learning about the Bible into your Sunday liturgy. From Oral Tradition to Canon: clear graphic that shows how the Bible, as we know it, came into being. Great poster graphic! Biblical Timeline: shows the main Biblical characters in their place in history. Another poster that will inform adults as well as youth. A-Z for Teachers: glossary of words and concepts kids (and adults) don't know about and teachers worry they might ask about! Your "User-Friendly Guide to FaithBook Connections" gives you lots ideas and options for how to implement FaithBook Connections in your congregation. Help your congregation's members become Biblically literate and expand their faith today!